Once the tricky political agreements have been reached, how do nations take apart their nuclear weapons? 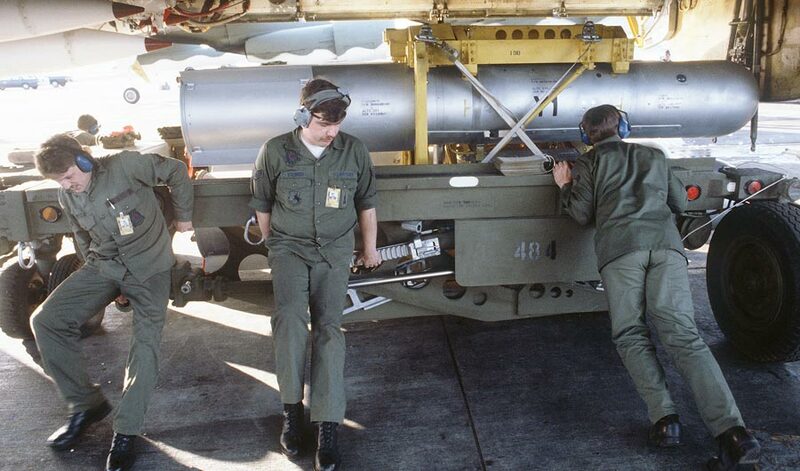 A Mark 28 thermo-nuclear bomb is unloaded from a U.S. Air Force Boeing B-52H Stratofortress aircraft. (Inside Science) -- There are enough nuclear weapons in the world to cause atomic Armageddon many times over, according to scientists, who estimate that no country could fire more than 100 nuclear warheads without wreaking such devastation that their own citizens back home would be killed. Most nuclear nations recognized by the Treaty on the Non-Proliferation of Nuclear Weapons -- namely, France, Russia, the United Kingdom and the United States -- have set about reducing their arsenals. China is a notable exception. The exact number of the country’s warheads is unknown, but many analysts say its cache is slowly growing in size. North Korea, on the other hand, while notoriously difficult to predict, could eventually scale back its nuclear program if its diplomatic rapprochement with the West continues. Negotiations on nuclear disarmament are politically tricky. But when agreements are reached, scientists and engineers can provide a variety of tools to take apart some of humanity's most deadly weapons and store or repurpose the dangerous nuclear material. It’s a long and complex procedure, but experts say it’s one worth doing. How to disassemble an armed "Swiss watch"
Nuclear disassembly is a coordinated process, which involves politicians, scientists and engineers working together. It all begins with the blueprints that designers used to build the weapon in the first place, according to experts. To unpick a nuclear device, engineers need to know the exact sequence in which the pieces were originally put together. “The design of atomic bombs is what I’d call an open secret. There aren’t that many ways of designing them and so if the Americans had to deal with the North Korean bombs, for example, it wouldn’t be much of a mystery to them,” said Rosner. But the more sophisticated and destructive hydrogen bombs that the Americans, British, Chinese, French and Russians possess is a different story. Other experts agree that unpacking the design is the most challenging part of the process. "It’s less about the nuclear material and more about the engineering,” said Tom Plant, director of Proliferation and Nuclear Policy at the Royal United Services Institute for Defence and Security Studies, an independent think tank in the United Kingdom. It would be significantly harder and therefore less likely that a team of engineers could disassemble a hydrogen bomb without knowing the exact design sequence, but still not technically impossible. “It’s very unlikely that it would blow up if a mistake was made in the process of disassembly, unless it was designed to blow up in that eventuality, which is possible though not likely,” said Rosner. Plant agrees the worst-case scenario is accidental detonation, but there are other possible perils if disassembly goes wrong. The people doing it could be electrocuted or exposed to the nuclear material or other toxic chemicals. But a country, knowing its own design, should be able to disassemble its own modern nuclear weapons, and many have. As of 2014, the U.S. had dismantled 85 percent of its declared stockpile of nuclear weapons since 1967 when it had more than 31,000 war-ready nuclear warheads, according to the U.S. Department of State. What do you do with the leftover uranium or plutonium? Once the weapon has been taken apart, the process of dealing with what’s left is identical for both the older and the more sophisticated bombs. One obvious answer is to repurpose the radioactive material -- either plutonium or uranium -- to produce electricity. To make it suitable for a power plant, the material needs to be diluted with less enriched versions. But that isn’t what actually happens to most of the radioactive material. “Mostly it’s just stuck in storage facilities,” said Rosner. Decommissioning the radioactive waste and keeping it safe is a science in its own right. The extracted uranium or plutonium will contain different isotopes -- variants of themselves that have different atomic masses, which means their radioactivity decays at different rates. The highly radioactive isotopes have short half-lives, which means they decay much faster than the less radioactive ones, and that creates a lot of heat. The less radioactive isotopes are slower to decay, which presents its own problem. “They have nuclei that are heavier, so they have very long half-lives of millions of years and you still have to do something with them. You can’t just leave them hanging around,” said Rosner. The answer is to store the radioactive rods in specially designed containers, often called “dry casks.” These vessels are usually made from steel and welded shut to prevent leaking. Each of the casks is then encased in another steel shell and then in a thick layer of concrete to prevent radiation escaping. “If you were standing outside of the container then you wouldn’t be able to detect radiation,” explained Rosner. But even this containment option has its drawbacks -- the cost of building, maintaining and monitoring these facilities will never go away so long as the rods inside are producing radiation. “That’s basically eternity for humans,” said Rosner. Additionally, there’s national security to consider, said Plant. "Governments will be keeping it somewhere safe in case they want to reuse it or in case a terrorist tried to get hold of it." That’s why a third option has become more popular in recent years: partial disassembly. After all, unless the bomb is detonated, the nuclear material inside is in a steady and contained state -- partial disassembly keeps it there while removing the opportunity for the bomb to be used. “If you remover the trigger, then what’s left can’t be used as a bomb,” said Rosner. But partial disassembly is reversible; the trigger can be put back in and the warhead can therefore be reactivated. “You couldn’t put it back in a matter of hours so they can’t be on standby. You’re talking about weeks to do it,” said Rosner. If North Korea should ever agree to denuclearize, it has a few options to consider -- none of them are perfect and all of them come with long-term strings attached, but when nuclear powers work together to control their arsenals, the world is a safer place, said Plant.